When we look at our own children we wonder how their lives will evolve and what path they’ll take. For some area children, their dreams came true for a day. Follow along as we take you on these adventures through the eyes of five local children and what they one day hope will be a successful career path. 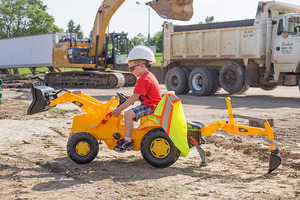 Nine-year-old Calvin loves to dress the part of his future dream job. He one day hopes to be the mayor! Calvin recently spent some time with Sioux Falls Mayor Mike Huether and got a firsthand look at what it takes to be lead a leader. 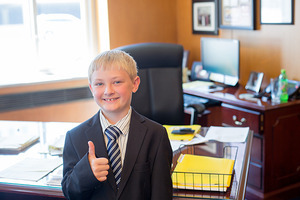 From an introduction on proper introductions to a tour around the office, Calvin had the chance to learn about leading a city and what the job would be like. “People will ask me, what’s the best thing about your job?” Mayor Mike Huether said to Calvin. Calvin says he hopes to be a Mayor who is able to meet a lot of people and help out his city and dressing up like the Mayor is at the top of his list too. His parents, Heather and Tom, say Calvin likes to be in charge and in style. On this day he learned that being a Mayor is more than dressing the part. He listened to Mayor Huether who offered some valuable life lessons. Kaylen has known from a very young age that she wanted to be a chef. 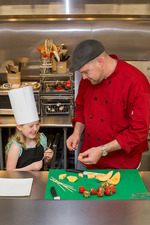 When Kaylen recently had the chance to meet Chef Lance White from Chef Lance Catering at Maxwell Food Equipment, she could barely contain her excitement. They spent time talking about cooking and even made fruit kabobs. Kaylen dreams of one day owning a restaurant, or doing a cooking show. Her mom, Amanda, is not one bit surprised by Kaylen’s dream. Amanda has captured plenty of videos of Kaylen in action in her mock cooking shows. Check out a video on our website! Marillya dreams of one day being a dentist! She recently had a chance to visit with the doctors at Family Dental Center in Sioux Falls. She learned about all the equipment and the importance of taking good care of her teeth. She says when she grows up, she hopes to be the one teaching people about dental hygiene. teeth,” said Marillya. “You need your teeth to eat!” Marillya’s mom, Kendra says Marillya has always loved going to the dentist. She looks forward to it every year. And she notices that clean feeling after going to the dentist. “I like it because your teeth are nice and clean,” said Marillya. Damon is a determined little guy who loves digging in the dirt! Damon suited up and went on the site of where the new indoor aquatic center is being built in central Sioux Falls. He spent some time with construction workers from Journey Group and while he was a little intimidated at first, it wasn’t long before he was anxious to get to work. Trenton lives on a farm in Luverne, MN and he dreams of being a farmer one day, just like his dad. While Trenton thinks he’s playing, he’s really helping his family. Springs. He took a tour looking at animals and equipment and even got to ride in a sprayer and see how it worked. One day he hopes to own one himself. 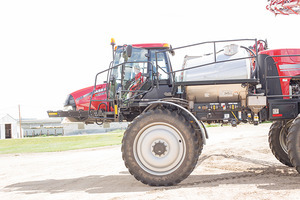 “To be able to drive a tractor, plant crops and feed them to my animals,” said Trenton. For now he’s content learning all he can about farming and while he might not have his own tractor, he’s found a way to do farming in his own way at the age of six. “I like to chase and catch the lambs, play with my bottle lambs and check the crops on the four wheeler,” said Trenton.